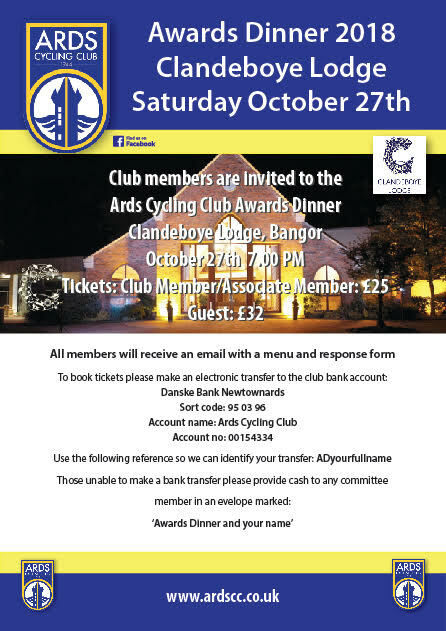 The Ards Cycling Club Awards Dinner is on Saturday 27th October this year in the Clandeboye Lodge. All members should have received an email about this. It’s always a great night so please let us know if you are planning to attend. The medals and trophies from club competitions will be presented at the dinner – click here for more information on the club medal scheme and what the club trophies are awarded for. Many of the trophy winners have been announced during the racing season, but we’ve only just worked our this year’s senior Best All Rounder. There’s more information on this prestigious trophy here. This year there were seven qualifiers. The remaining trophies will be announced on the night. Don’t miss it – reserve your place now!